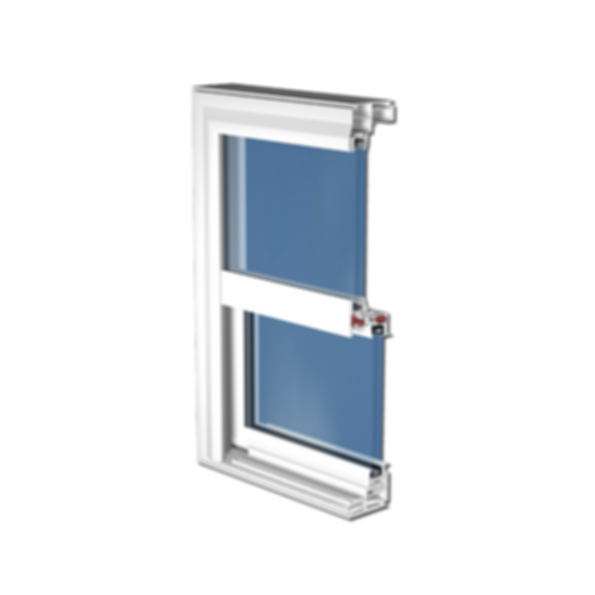 DYC "Classic" 6000 Series vinyl welded window system includes a single hung and companion single slider, 3-Lite slider, and picture window all featuring a uniform frame appearance, offering consistency in every elevation in your home. The DYC Classic Series offers a slimmer profile unlike older bulky vinyl frames. This new window system is made to order and built in custom and standard sizes and shapes for both replacement and new construction applications. This new window is currently available in Linen White and Adobe. Bettervue® improved visibility screen is standard allowing better airflow. 2 7/8" main frame depth for a slimmer, less bulky profile. Aluminum reinforcement on lift rail, lock rail, and fixed rail for extra stability. Fusion welded frame and sash provides an impenetrable barrier to air and water penetration and superior strength and integrity. 3/4" overall insulated glass is standard. Dual weather stripping with Eco-Ban antimicrobial yarn to resist air, mold, mildew, fungi, pollens, water, and dust. Sloped sill provides a path for maximum water runoff. Strong composite cam-action lock ensures positive locking. Patented Roller-Tilt constant force balance system for effortless and maintenance-free operation and improved egress. We are a family-owned and managed wholesale manufacturing business. Don Young's initial focus on manufacturing and installing storm windows and doors and thermally-broken aluminum replacement windows has developed over the years into significant company expertise in product application, sales and field service. Discuss products and projects with your online Modlar community.